These three companies could still be in relatively early stages of their long-term growth trajectories. Disney has grown its kingdom by leaps and bounds since hitting the market as a publicly traded company back in 1957. The business has probably launched more hit entertainment franchises than just about any other company on earth, expanded its operations beyond the U.S. to become a global multimedia empire, and delivered magical returns for shareholders along the way. That's the kind of success story that it pays to be a part of, and to help put readers on to other companies that could have what it takes to follow similar trajectories, we asked a panel of Motley Fool investors to identify businesses with bright futures. Read on to see why they identified Netflix (NASDAQ:NFLX), General Motors (NYSE:GM), and Activision Blizzard (NASDAQ:ATVI) as investments that have the potential to deliver some Disney-style magic. Dan Caplinger (Netflix): There's been a transformation in the entertainment industry, and companies across the sector now understand that content is the key to success. Disney was quick to learn that principle, and over the past 60 years, it has taken great strides to build on its initial foundations in content creation. Just as Disney has moved aggressively to acquire rival studios to add to its already impressive collection of movies and television programming, Netflix has started to build out its own content production and acquisition strategy, hoping to cut out studio intermediaries. Netflix seeks full vertical integration, from creation to distribution, ensuring that it can hang on to as much revenue and profit from its efforts as possible. Most investors are currently focusing on Netflix's ability to pick up new subscribers across the globe, and the company has been highly successful in keeping the viewers it has and finding additional ones. Yet in the long run, what will keep subscribers coming back is high-quality content. Disney and other content-producing rivals see the coming threat from Netflix, and so you can expect to see plenty of fireworks as the companies jockey for position to attract consumer eyeballs. Netflix has done well so far in standing up to its peers, and it'll be interesting to see how much Netflix's content-creation business grows in the coming years. Travis Hoium (General Motors): In 1957, Disney was one of the most successful entertainment companies in the world. It had released hits like Pinocchio, Bambi, and Peter Pan. The company had also recently opened Disneyland, which became the formula for its theme park business. But Disney was far from the company it is today, with media networks, studios that offer a wide variety of content, and theme parks around the world. I see a lot of similarities with General Motors, which is a leading automaker today but has the opportunity to be a dominant player in the future of transportation. GM's Cruise division makes arguably the most advanced self-driving vehicles in the world, and its Bolt will become the foundation for the company's future ambitions. If all goes well, the company plans to launch a self-driving taxi service in multiple cities next year. To put the opportunity for self-driving into perspective, people drove 3.22 trillion miles in the U.S. in 2016, and General Motors expects to make a profit of $1 per mile on its self-driving taxis. A $3.22 trillion profit may not be realistic, but if GM can capture even 1% of the miles driven with self-driving cars, it would be a huge win. GM Operating Income (TTM) data by YCharts. From a value perspective, General Motors is cheap by almost any measure. 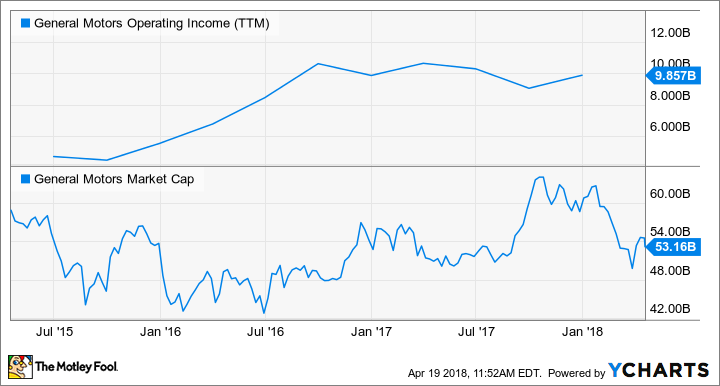 Above, I've highlighted the company's market cap and its operating profit, which doesn't include the impact of the recent tax reform and writedowns from asset sales. Long term, I think the core manufacturing business will be a cash flow engine that will fund the self-driving future. And if GM can build out a network of self-driving taxis around the country (or world) that captures a meaningful share of the miles driven by consumers, this could be a growth stock for decades to come. Keith Noonan (Activision Blizzard): Disney had been in operation for roughly 30 years before going public in 1957. For comparison, Activision was formed in 1979, Blizzard was founded in 1991, and the two companies have only existed as a combined entity since 2008. Like Disney, Activision Blizzard operates in the entertainment space. Currently, the company's specialty is video games, but it's also in the process of building a multimedia empire that might one day rival what Disney has built. The company is behind hit properties including Call of Duty, Candy Crush Saga, and World of Warcraft. These are franchises that have proven staying power, and they give the company's world-class development teams a strong foundation of intellectual properties to build upon. Much as Disney has a wealth of top-notch creative studios, Activision Blizzard has assembled the most formidable assortment of game development teams in its industry. That's an advantage that should help it stay at the forefront of interactive entertainment as the medium continues to evolve. Today, there are more people playing video games than ever before, and the popularity of gaming looks like it will continue to increase going forward. Activision expects that rising interest in video games and the proven appeal of its big franchises will help it springboard into the movie and television business, and the company could have other big growth drivers if categories like esports and virtual reality continue to gain traction. Activision Blizzard has proved to be remarkably adept at navigating changes in the gaming industry over the last several decades. It's a well-run business that has what look to be sustainable competitive advantages, favorable industry tailwinds, and opportunities that could translate to huge growth over the long term.